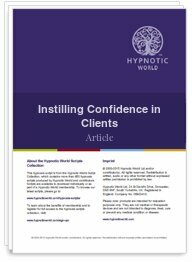 As a Hypnotherapist you will no doubt be requested many times to help your client's with their confidence. Whether they need confidence in the workplace, confidence for dating or to generally feel more at ease you will find this article useful for supplying ideas on how to approach this issue. Please note that this is not a script to be read out to your client during a hypnosis session.